The Dot- Matrix is tough enough to be booted around your local, and offers all the basic requirements for onstage tuning. All you need for onstage tuning. A workhorse guitar tuner pedal isn't the most exciting purchase you'll ever make, but it's probably the single biggest improvement you can make to your sound. "With its 20 room-illuminating blue LEDs spelling out your note for you, you're unlikely to get it wrong." 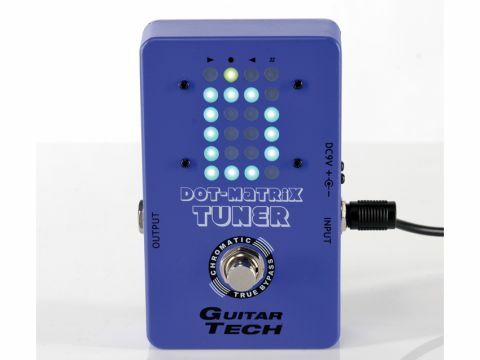 If you don't have £75 to spend on the heavyweight tuning pedals out there (think Boss' TU-3 and the TC Electronic PolyTune released last year), then the recently launched Guitar Tech Dot-Matrix Tuner is willing to cash your cheque for less. There are a few essential requirements when you're buying a tuner: accuracy, speed and (for live use) visibility. The chromatic Dot-Matrix Tuner detects the pitch of your note automatically, then quickly tells you if you're in or out of tune. It's equally fast to retrack when you make an adjustment, so can get to the green light without too much jumping. With its 20 room-illuminating blue LEDs spelling out your note for you, you're unlikely to get it wrong. The Dot-Matrix is also true bypass, so it doesn't become a tone vampire when switched off, and the output is muted when it's engaged for silent tuning. We were a bit dubious of this pedal before we plugged it in, if only because of its slightly generic looks. It'a missing the tuning presets of its more costly competition, and the green 'in tune' light is annoyingly off-centre. However, the good far outweighs the bad with this one.